A well-stacked wood pile is a thing of beauty: a jigsaw puzzle, a study in geometry and aerodynamics. As an old Maine saying goes, the idea is to leave enough space between logs so the mouse can get through, but not the cat chasing the mouse. It is a proud Yankee art form, choosing and placing the logs, and the finished pile is a rustic monument to hard work, tradition and ingenuity. The wood for the upcoming winter is hauled out of the forest, split and stacked in late spring. Saturdays are spent swinging an ax, or using a splitter, and the air fills with the perfume of sawdust. One puts in the effort as the blooming season begins, and the payoff is gotten as the bloom dies for the year. Summer is the time for seasoning. The hottest months whisper the intoxicating smell of wood smoke and the coldest nights of winter. This is the essence of life in Maine: each season brings hints and intimations of the coming seasons. The summer goes on, and the wood pile stands its ground, at work in sure silence. The hot breezes that rustle the hay pass through the logs, pulling the moisture out of the wood. In high summer, the wood pile cools the soul with visions of chill nights spent in a stupor next to the wood stove. Finally the wood has seasoned. The autumn has arrived. Saturdays are spent disassembling the pile and reassembling it in the wood shed. The first logs, perfectly dried and ready, go into the stove, starting the warming season. 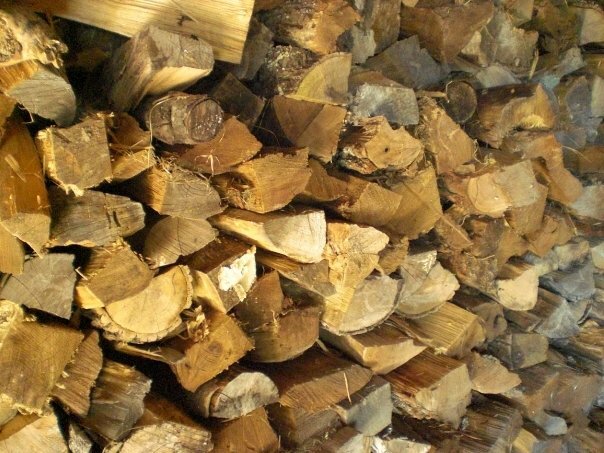 Firewood is born in spring and matures in summer. It hints of the autumn harvest and cozy winter evenings. It is of its time, and of the seasons to come. The wood pile is quintessential Maine and New England: timeless art, practical utility and harbinger of the seasons to come. Your post gave me wood. I moved to New England thirteen years ago and your absolutely right. Stacking wood correctly is serious business. Believe me I know. I got set straight on how to stack a ‘wicked’ good pile of wood by my MA native husband. The bark side goes DOWN, wink. Well, I learned something practical, factual, and I have a heightened sense of smell. The wood pile’s geometry is an awesome delight. That’s really awesome to read, since I failed pre-algebra twice in high school…. Whatever, you pass words with me. Love this, Brian. I have a great photo of my Dad chopping wood with the big stack behind him. Now I’m inspired to dig it out. Thanks! Saw your name on my page so I came a call’in. You write beautifully.